Initial brain MRI at the onset of status epilepticus is unremarkable, but a few days later, MRI shows symmetric increased diffusion-weighted images (DWIs) or T2/fluid-attenuated inversion recovery (FLAIR) signals in the hippocampus, amygdala, insula, claustrum, thalamus, perisylvian operculum, and basal ganglia (A–C). These newly appearing lesions are likely associated with persistent seizure activity that was highly refractory to conventional antiepileptic treatments. 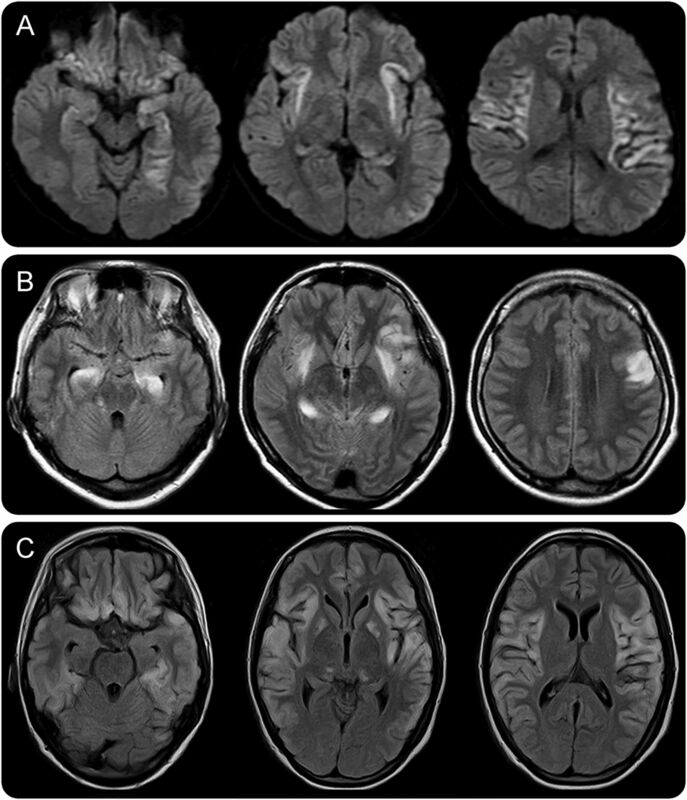 Brain MRIs were obtained on day 20 of the onset of status epilepticus (A, patient 3), day 3 (B, patient 6), and day 74 (C, patient 9). (A) DWI and (B and C) FLAIR images. Initial brain MRI on day 1 was normal, but follow-up MRIs show symmetric medial temporal fluid-attenuated inversion recovery (FLAIR) hyperintensities on day 6 (arrows), as well as follow-up MRIs show rapid spread of hyperintensities in a symmetric distribution involving the medial temporal lobes, claustrum, insula, and perisylvian opercular cortex on day 20 (arrows). Generalized convulsive status epilepticus was extremely refractory to antiepileptic drugs, continuously infused anesthetic agents, and the first-line immunotherapy (IVMP and IVIg). 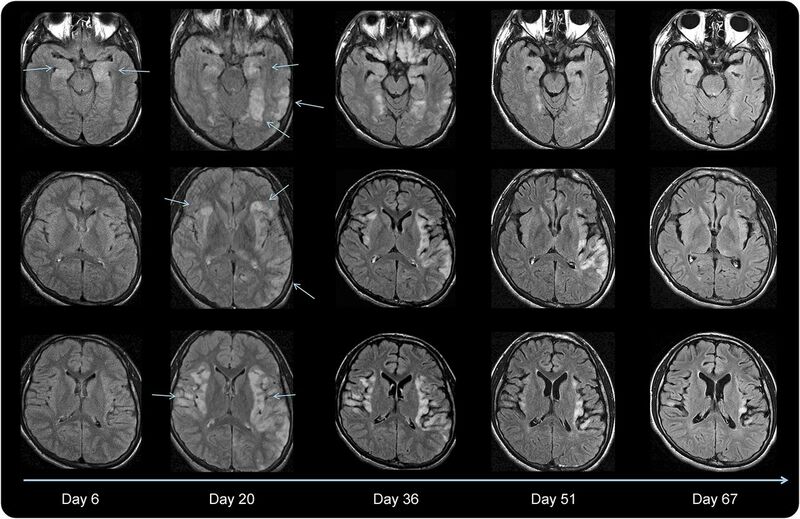 The patient was treated with IVCPA on days 20 and 52, with additional IVMP, IVIG, and PLEX, resulting in reduction in seizure frequency with gradual resolution of hyperintensities, but mild brain atrophy was seen on day 67. Note gradual resolution of FLAIR hyperintensities following 2 cycles of IVCPA (tables e-1 and e-2). IVCPA = IV cyclophosphamide; IVIg = IV immunoglobulin; IVMP = IV high-dose methylprednisolone; PLEX = plasma exchange.